diodrio, Pen Holder, Pencil Holder, Pen Sleeve Case for Notebooks, Journals, Rigid Tablet Covers. Ultra Flat Design (2mm Thick), Detachable, Elastic Band, Premium Soft Touch PU Leather. 2 Per Pack. ULTRA FLAT DESIGN - Thickness: 2mm. Stay really flat when attached on hardcover journal/Planner/tablet covers when not in use. Made of premium soft touch PU leather. This material brings FANTASTIC FINGER TOUCH. Dimension: 160mm x 37mm x 2mm. HOLD ONE PEN OR ONE TABLET STYLUS - Design to hold one pen, or one tablet stylus. Fit any pen or stylus with it's diameter less than 12mm (less than 0.47 inch). It holds the pen securely throught it's ultra flat structure, and the pen can be quickly taken off. It's a great product for everyday use for high frequence note taking users, and field notes users, etc. COMPATIBLE TO JOURNALS - This pen holder's elastic band wrap around length ranging from 8.0" to 10.5". So it fits any HARDCOVER journal / notebook / planner, with it's cover's hight between 8.0" to 10.5". 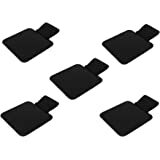 COMPATIBLE TO TABLETS - it fits any tablet, and it's rigid protective cover, with it's hight between 8.0" to 10.5". 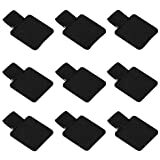 For tablets, compatible with iPad 7.9"/9.7"/10.5"; Kindle Fire 7"/8"/10.1"; Samsung Galaxy Tab 7"/8"/9.6"/9.7"/10", and etc. 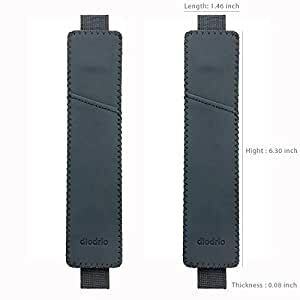 GREAT GIFT - diodrio Ultra Flat Pen Holder could be considered as great gift for family, friends and anyone you think who deserves a great gift. This pen holder is sturdy and easy to carry with your hardcover journal/tablets for everyday use. To meet various needs of customers, we also provide different product sets with different packagings, pls check diodrio other packs. 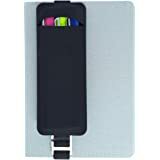 diodrio Pen Holder,Ultra Flat Design (2mm thick),Detachable,Hold One Pen/Stylus.Made of Premium Soft Touch PU Leather,Compatible With Hardcover Journals & Tablets.2 Per Pack. 5.0 out of 5 starsI like this much better than the adhesive disk style holders I've been using. This is nice because I can move it from one notebook to another as needed and it is easy to insert my Pigma Micron pen. The disk loop style I've been using was nearly impossible to get the blunt Micron into. Another nice thing is this lays flat when the pen is removed so the notebook can lay flat as well. I would recommend it to a friend. Works very well! I use this on my bullet journal. Fits two Pilot G2 Pens snuggly. I put a small metal ruler in the 2nd one and keep that on the inside of my bullet journal. Overall I like the material and feel. Only gripe is that over time the elastic gets looser and the holder starts to sway. I have a pencil case similar to this one, but it closes with a zipper on the side. I like this one since the top is open, so I have easier access to my pens. You can fit 1 pen if it is a thick pen, or 2 pens that are skinny/medium size. I keep this with my planner so I always have a pen handy, and because the elastic helps keep the planner shut. I use one of these in the golden/grey combo to hold my small metal ruler and a pen on my bible. 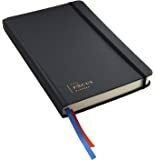 I use an ESV Single Column Journaling Bible with a cloth cover. 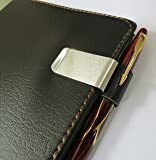 This holder is just the right dimensions to slip over the cover and stay in place with the ruler and pen inserted. I have also slipped a small notebook between it and the cover and it's staying in place as well, but I imagine it might stretch out the elastic over time. So far very pleased but I anticipate the elastic might eventually fail anyway. But then, it's a two pack! This is too small to be useful on anything but the very smallest pocket notebook. It absolutely will not fit on a normal sized notebook.